Smoothly shifting between subplots while capturing disparate takes on life and love, Intermission is a gem with a sense of humor that jumps from vicious to sweet and back again. Intermission doesn’t tell just one story, or even a couple stories. It’s a collection of interweaving storylines, with characters veering into and out of each other’s lives. Think of it as a transatlantic melting pot, featuring ingredients familiar to movies as polar opposite as 13 Conversations About One Thing and Trainspotting. One of the primary stories features Colin Farrell (Daredevil), who returns to his homeland to play Lehiff, a no-good street thug looking for an easy quid, no matter who has to get hurt. 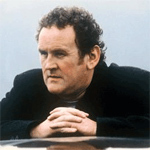 His nemesis is Jerry Lynch (Colm Meaney, The Commitments), a detective with a vigilante bent looking to star in a new reality TV series. Jerry also has a thing for Celtic mysticism and Irish bands like Clannad. The other major thread follows Sally (Shirley Henderson, Bridget Jones’s Diary), a girl still reeling from a love affair gone drastically sour. So devastated by her mistreatment at the hands of a shallow, callous man, she no longer shaves and sports a bit of a “Ronny,” a mustache that confounds a TV news crew trying to interview her following a bus accident. Sally’s sister, Deirdre (Kelly Macdonald, Trainspotting) has recently broken up with her boyfriend, John (Cillian Murphy, Girl with a Pearl Earring), and taken up with an older man, a balding banker named Sam (Michael McElhatton, Spin the Bottle) who leaves his wife for Deirdre. As events unfold, John’s best friend, Oscar (David Wilmot, The General), a shy, sexually frustrated young man yearning for love, meets Sam’s wife, Noeleen (Deirdre O’Kane, With or Without You) at a club catering to an “older” crowd. Needless to say, the two are quick to fulfill each other’s immediate needs. The bus accident witnessed by Sally and her mother, Maura (Ger Ryan, The Commitments), becomes an unlikely catalyst for a sequence of events that merge the main storylines together, leading to, of all things, Deirdre’s kidnapping. This is the first feature film for both the director, John Crowley, and the writer, Mark O’Rowe. With an auspicious start like this, they’ve got a promising future. Yes, there’s a lot of foul language and moments of violence, but neither are gratuitous. The language adds plenty of local color. Maybe it’s the Irish lilt, but the vulgarity is not of the jolting caliber found in Martin Scorsese’s “edgier” films. Likewise, the violence stays true to the characters and their predicaments. This is the most logically character-driven film in quite some time, an accomplishment all the more impressive considering the large ensemble cast that is being juggled. Ultimately, Intermission is about life’s choices. The fleeting moments in which they are made lead to the inevitable rewards or consequences. Desperate and the broken-hearted souls deal with the wrongs thrust on them and learn to walk on, while the perpetrators of pain get their comeuppance. With its independent film sensibilities, Intermission has a satiric edge that is comfortable poking fun at life in Ireland as well as taking jabs at the media and the contributions to Irish culture made by the United States. No stone is left unturned as all parties get their share of the jokes and the drama. Even Henderson (Owen Roe, Michael Collins), a mean-spirited supermarket manager who takes delight in making the working hours of John and Oscar a living nightmare, gets some chuckles with his use of American catch phrases; he’s also fond of reliving his moments of absolute power over his subordinates while driving himself home. Even though he’s only a minor character, Henderson still gets his comeuppance, inadvertently paying for his ill will as the latest victim of an antagonist responsible for the film’s overarching chain of events. Intermission is a low-budget independent film from Ireland, and that works to the movie’s advantage as it reverts back to good old-fashioned storytelling and a collection of memorable characters that make this Intermission a break well worth taking.